The Holy Trinity is serious stuff to Christians of all denominations. We’ve enshrined it in our Creeds including the Nicene Creed (325 CE), and the Apostles’ Creed (circa 390 CE). There is also the Athanasian Creed which was written in the 6th century. It’s the longest and most exhaustive of the three. In churches where these three Creeds are used, I have encountered everything from staunch adherence to every word, to saying the creeds with our fingers crossed behind our backs! There are a number of Christians who find portions of these Creeds problematic. If you’re one of them, then this post is for you. If you’re not, you might want to stop reading because this is going to make your head explode! What if we reimagined the Trinity, drawing inspiration from our Pagan and Wiccan brothers and sisters? Both spiritual traditions believe in the One, the Source, who is referred to by many names: the Unknown, the Divine, Great Mystery, Creator, Eternal One and Holy One. Some Christians see this aspect of the Divine as exclusively male because the Bible refers to the Holy One in this way. However, a growing number of us see the Eternal as beyond gender boundaries and constraints. We feel it’s far too limiting to refer to the Great Mystery in such an anthropomorphic way. Then we come to Jesus who, in the Christian tradition, is the second aspect of the Divine. He is the Lord of Life, the Light of the World, etc. I have always had a strong connection to Jesus because he embodies everything that our puny brains can handle about how the Eternal One works in our world. Even then, we argue about what his teachings mean because the Reign of God is too complex for us to fully understand it. In Pagan circles, they honor the God, who is sometimes referred to as the Lord. While our two religious traditions vary widely here, we at least have a small connection in honoring the male aspects of the Divine. Now, comes the tricky part. Christians have the Holy Spirit to round out the Trinity. 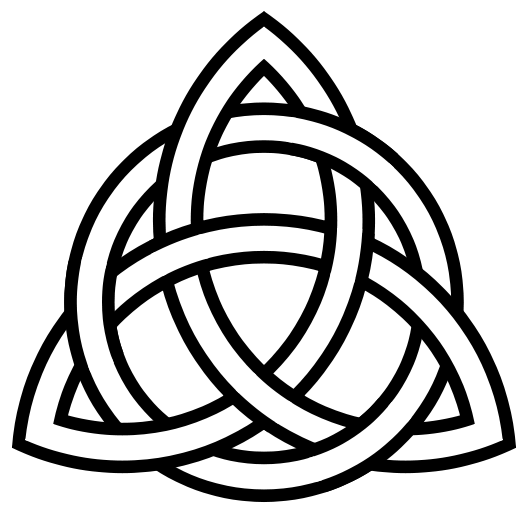 Pagans have the Goddess to round out their “trinity.” While many Christians think of the Holy Trinity as male, I would argue that this is the feminine aspect of the Eternal One. In Old Testament Hebrew the word for “spirit/wind/breath” of God is RUACH which is a feminine noun. In New Testament Greek it’s PNEUMA HAGION which is also a feminine noun. Now I know that gender of a noun does not always mean it’s referring to a male or female. But why can’t we entertain the possibility? The Holy Trinity, as it stands in it’s traditional form, is lopsided and male dominated. I just can’t roll with it anymore, and I am certain that there are others who feel the same way. Therefore, maybe we can envision the third aspect of the Divine as the feminine spirit who is a symbol of nurture, inspiration, creativity, etc. We could also envision her as Sophia, Lady Wisdom, from the Old Testament (See Proverbs 8-9). According to the Bible, Sophia was formed at the beginning, before the creation of the earth. I believe she is the RUACH that set things into motion when the Eternal One spoke light into being. She is also the PNEUMA HAGION of Pentecost whose whirlwind and tongues of fire empowered the first disciples, just like She empowers us now. If you’re still reading this post, then you probably don’t think I’m a complete and total heretic. I don’t mean to offend anyone. I just think there’s room for a little feminine Deity in our conception of the Trinity. I’m sure my view of this will evolve over time. But for now, this works for me and gives me an understanding of the Trinity that feels more balanced. Honestly, I don’t think i would have come to this point if it weren’t for my Pagan brothers and sisters whose conception of the Great Mystery, God and Goddess is much more balanced than the Creeds of my childhood. This entry was posted in Goddess, Spirituality and tagged Pagan, Spirituality, Wicca. Bookmark the permalink. Nice article. I think Wiccans and Pagans do have the Holy Spirit, only that we call It Akasha or Aether. Some just call It Spirit, when they’re not referring to a particular god or goddess. Yes, that’s definitely one way to look t it with the five points of the pentacle representing the four elements and spirit. I also know that some Pagans, unknowingly, have their own trinity with the Unnamable, the Source of All that is, as one aspect, and the Lord and Lady as the other two. In both Christian and Pagan belief it’s clear that the Divine Presence comes to us in many forms, even though Christians have a hard time admitting it! Christians have been arguing about this for millennia and I doubt the conversation will ever be settled! Blessed be!